Play if… you enjoy archaeology or a good adventure. Avoid if… you don’t like getting your hands dirty. Or monkeys. Description (from the company website): Dr. Bonedigger went missing four years ago while searching for a Lost Kingdom in the Mediterranean. His family summons YOU to solve the myster of his disappearance. Cost: $30, but discounted for the summer. Metro Access/Parking: No public transport that I know of (it’s in Colorado Springs), but there was ample parking and you can get a Lyft/Uber if you so choose. Description of the room: You start off at a very rough looking campsite with the bare necessities and everything you need to get your adventure started. If you wanted to take a quick nap, there’s a cot for you to do so. Understanding of the Mission: Once getting to the campsite, you have to use Dr. Bonedigger’s journal to decipher clues and find your way to the hidden temple, and then make your way home. We found the Professor and survived to tell the tale! Going to a new location has always been a little nerve-wracking for me. I never know if I’m going to find a gem or a giant turd (I guess you can put “polished” in there as a qualifier, since the MythBusters proved that was possible…). Anyway, I had seen a bunch of posts on Facebook for Pikes Peak Escape Room, and since I was going out to Colorado Springs for work, I reached out to see if they would be interested in hosting me as well as doing an interview for the blog. Their location (in the building) was a bit hard to find, but thankfully they put some specific instructions in an email to me, and the only trouble we had was finding parking because I forgot to park behind the building in the lot. Originally, we were signed up for their Death Row room. But when we got there, we were informed we would be doing the Lost Kingdom room since no one had signed up for it at the time, and they wanted us to experience it on our own (meaning no strangers). So we did! Read on. The blurb on the website is pretty simple. Dr. Bonedigger has gone missing while searching for a lost temple in the Mediterranean. You receive his journal and decide to follow the clues in it to see what happened to him. Meh. When we got into the room itself, the briefing we got was – thankfully – more in-depth. While traveling, he had heard many local stories about an uncharted island that held a source of immense power. Upon returning to his day job, he used what he learned to determine where it could be and planned to go the following summer. When he didn’t return to the school in the following semesters, you and your classmates decide to track him down and find his campsite, and this is where the escape begins. The intro video itself well put together, if not a little stiff sounding, but helps to set the stage. With Dr. Bonedigger’s journal having been found at the campsite, you must use it to decipher many clues and puzzles around said campsite to determine what happened to him (in what you assume were his final days of life). Then, of course, you have to figure out how to get out and on your way home safely. 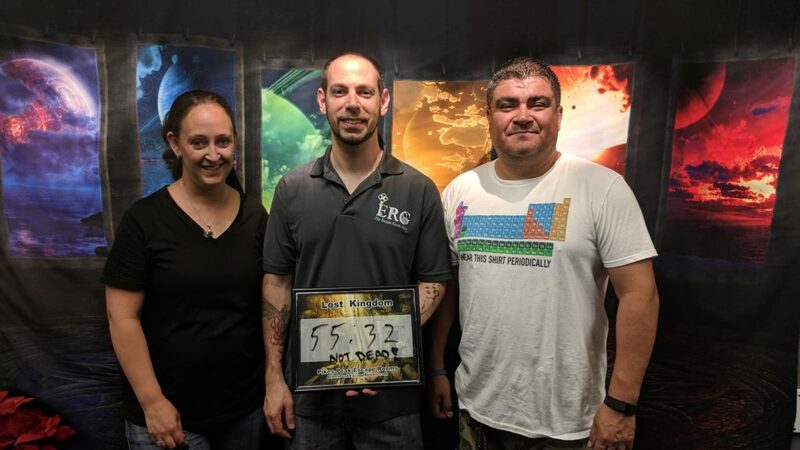 There were several nicely subtle puzzles that I was able to pick up on based on my escape room experience, things that would end up helping the group in subsequent rooms we did that weekend (since we did 3 in total). There was just nothing typical about the puzzles in this room. I will give you one hint below, though, if you know how to find it. HINT: Yes, you do need to use the periscope. Not going to tell you what for, obviously, but I couldn’t figure out how (well, I knew how, but just couldn’t do it). There were a couple of combination locks, but they are kind of expected, being out in the jungle and such on a campsite. Everything else was tech or something custom, so well worth the experience. It’s pretty obvious in this room once you start looking around that there is a second part, so I don’t think I’m spoiling anything by telling you now that the puzzles in the second-half are significantly more difficult than the puzzles in the first (and you should expect to be done with room 1 by the 15-minute mark I believe). You do have one or two combination locks, as I said, but that’s just to get you started. There’s a couple of things that you may recognize as toys of your youth that, while totally unexpected, were fun to use. The second half is where the real fun begins. Most puzzles are custom designed for this room, meaning I have not seen them anywhere else, with the exception of one that I will say no more about other than that it’s one of my favorite types. I will, however, say that there is a fair deal of transcription/translation to be done in this room. It’s not difficult, just a bit tedious. However, with everything you find in Dr. Bonedigger’s Journal, it’s both somewhat expected and simple enough. The final puzzle, however simple it may have been in retrospect, threw us for a huge loop when it came down to crunch time and we needed that second clue. Everything in the rooms worked well together. My only wish would be that there was some sort of in-between room from the two that are there. The transition from one to the other is stark and left me wondering how I got from one to the next (though I do understand what is supposed to be happening). And, as Marco wrote on our time card at the end, we didn’t die. So there’s that! This was a fun room. There wasn’t the sense of urgency you get from some other rooms, but part of the experience is working with your teammates. And for people who had only escaped one other room, their record remains 100%. We had fun escaping and – again – as Marco said, we didn’t die. Their use of baby monitors here is genius. Easily the best and easy-to-use setup for communication I have encountered. Who knew?? Les was pretty hands off until he caught us struggling or spending too much time doing something. We had a couple of nudges and clarifications, but I think there were 2 solid clues in there that helped get us back on track. Nothing to report on here. :/ Or should that be a 🙂 ? Final Thought: Don’t let the overall rating fool you: This was a good, fun room. Sometimes, based on our scoring rubric, rooms get a 6-8 while being really fun. This one being borderline 8 is misleading because it was a perfect example of this and the fact that they built the bulk of the tech in-house makes this room (and this location) a solid Escape Room find. Definitely go check it out and take advantage of that discount code for the summer!